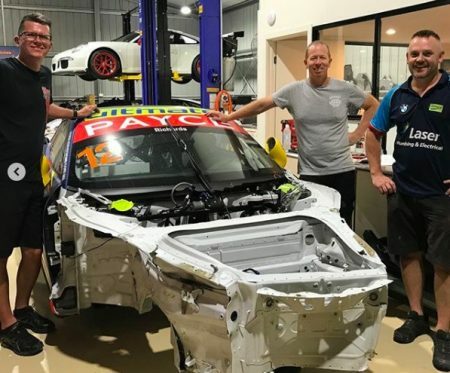 Garth Tander helped Steve Richards strip his damaged Porsche Carrera Cup car after a heavy crash forced Richards home early from the Adelaide 500. Richards was caught up in a heavy shunt six minutes into the opening practice session on Thursday, with the damage too extensive to repair at the track, forcing the team to go home before racing had even begun. The car was taken to Richards’ workshop in Melbourne with Tander lending a helping hand to his close mate on Friday afternoon. Together, with a mechanic, Tander and Richards were able to strip the car to its shell before having it sent off for repairs on Saturday morning. “Richo and I have been mates for a very long time,” Tander explained to Speedcafe.com. “(I) saw what happened with him on Thursday in Adelaide, and knew that he was going to have to have a tight turn around for AGP. “So, I figured he’d be coming straight back, so I texted him that Thursday evening. Richards says Tander’s help stripping the shell meant they were able to get the car in for repairs earlier than originally expected. “Garth, we’re good mates, and he was one of the first people, when he heard the news, flicked us a message to say, ‘If you’re around, I’m here… if you need a hand, no problem,’” added Richards. “So, I just said, ‘Oh yeah, that would be good.’ So, he came over, and actually, must admit, I wasn’t sure how long it would take because I got home at 9am Friday, in the truck, drove through the night. “Had a bit of a rest until 3pm in the afternoon then had Rohan, who’s our mechanic on the car, come in. The four-time Bathurst 1000 winner is confident the O’Brien Electrical and Plumbing-backed Porsche will be ready in time for Round 2 at the Australian Grand Prix in less than two weeks. “I’m 100 percent confident that we’ll be rolling into the track Tuesday, the same as everyone else, with a car that’s ready to go,” Richards asserted. Richards stopped short of ruling himself completely out of the Carrera Cup title, but admitted that he’ll need a miracle after leaving the opening round with a points tally of zero. “You never, ever throw in the towel, but losing 180 points to guys like Nick McBride and Warren Luff and David Wall, unless they have a problem, you’re never going to claw those back,” he commented. “We’ll just go into the rest of the year doing the best we can. You never know, things happen. I don’t believe in fairy tales, and you’ve got to be realistic. “The reality is, if anyone said you’re in an eight-round championship but you can only compete in seven rounds, you wouldn’t be expecting to challenge for the championship. Round 2 of Carrera Cup Australia takes place at the Formula 1 Rolex Australian Grand Prix from March 14-17.